BBC Radio 4 dramatised both Marathon Man and Brothers by William Goldman for their Saturday afternoon play slot. Back in the annals of time I’d read the books, so I had an idea of the complexities of the story surrounding Babe and Doc, but I still found a few areas of the plays a bit difficult to comprehend whilst listening. You can only fit so much into a 1 hour play, and stripping down both books to their bare bones makes what you're listening to a little confused. It is the back story, those missing series of events, that make you understand the characters, which gives them reasoning, even one as ruthless as Scylla. With this in mind, I set to rummaging in the loft to see if I still had the books and thankfully I did. I decided to read the books again and then listen to the plays...any excuse to listen to Tom again eh?! Run, run, as fast as you can. You can’t catch me I’m the Marathon Man. Babe is an intellectual, an aspiring historian. 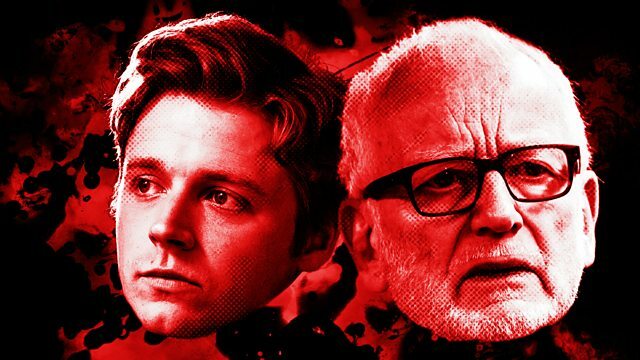 He is an ordinary bloke, trying to live his ordinary life, studying for a PhD in history, surrounded by the shadows of his legendary father. Perhaps it’s this shadow that makes Babe lack self-confidence. He knows the answers in class, but he won’t offer the answer, he might, just by the slimmest chance be wrong; so it’s better to be silent. In his dreams, Babe is going to be a legend of the track, a marathon runner. When he runs, he imagines his hero Nurmi running beside him, and then he takes over, he passes Nurmi and the crowds go wild! He’s a naïve, kind, romantic guy with dreams in his head, and this makes him such a relatable character. And it’s his love of running which will ultimately save him. Babe’s PhD paper examines tyranny in American politics; Roosevelt, McCarthy, Coolidge, all come under the spotlight. Their different methods are scrutinised by Babe, to be somehow pulled together, the disparate acts all tied together neatly to make a unified point about tyranny in American history. Babe’s thesis mirrors the disparate events that happen in the book. Seemingly unrelated characters and events all weave together in a masterly piece of literature. Two elderly men weave through the streets in a fit of road rage with calamitous results. Scylla heads to Paris on a clandestine mission, narrowly surviving death but now putting himself in the firing line. An old pal in Edinburgh must suddenly say goodbye to his friend forever. A man in Uruguay shaves his head, concealing his identity before walking out of his dental practice and flying out on a mission. And a beautiful woman snares Babe’s heart and attention. Doc loves his little brother, has taken care of him since their father committed suicide, and Babe adores his big brother, despite thinking him a pretentious pillock at times! Babe and Doc, their own secret names for each other, but their private names are not the only secret. Babe thinks his brother is a hot shot in the oil business, but Doc is not the only anonym he keeps, he is Scylla, the rock; Divisions lethal killer, and this is going to cause his brother a lot of pain and anguish. It takes a while to understand what is going on, but the constant toing and froing between Babe and Doc/Scylla’s characters guide you along a path where you know Babe will get mixed up in his brother’s dangerous affairs, and it is this which keeps you spellbound, makes you unable to put the book down. But it’s not all terror, there is some deftly woven humour in the dialogue, especially between Doc and Babe, the type only brothers could get away with, and you can’t help but chuckle as Doc tells Babe that something has to be wrong, no beautiful woman would ever want him. You know things are about to change when Doc pays Babe an unexpected but fateful visit. Babe is plunged into a nightmare, the chain of events drop into place, and things start to make sense. Betrayal and conspiracies link hands with historical crimes and make Babe, the marathon man run for his life, all the time with him getting close to answering that painful question…"Is it safe?" Now under normal circumstances, you would scoff at such delusions, but Goldman is a fantastic storyteller. I’m not going to say perfect, because like Marathon Man, the book starts with a number of disparate events…but really all you want to know is…what happened to Scylla? What happened to Babe? This is a book called Brothers, so why are we reading about two children buying sweets and being caught up in an explosion where their bodies are not found? A nubile young woman and her burly boyfriend succumbing to the perverted demands of an effeminate stranger? A teenage couple, both on the brink of a wonderful life taking part in a suicide pact? Kneeing a bloke in the testicles just to check out his integrity? This is a thriller that will take you on a surreal, disturbing, and sneaky journey. In the hands of a lesser writer you’d probably toss this nonsense aside, but Goldman is as manipulative as his characters. You are forced into entering this depravity and you come out the other side at least shocked, if not heartbroken. Whilst you know that Goldman knows what he’s doing, and that it is important to lay the foundations, it does get frustrating that you don’t hear about Babe until you’re nearly a third of the way through the book. It’s frustrating but actually rather clever. The reader is in the dark about all the events that have happened and so is Scylla. He has been stuck on an island, and it’s pretty scary arriving back in mainland USA where there is AIDs, and VHS and other acronyms he’s never heard of… time has moved on and Scylla must get up to speed or he’s never going to survive a second time around. 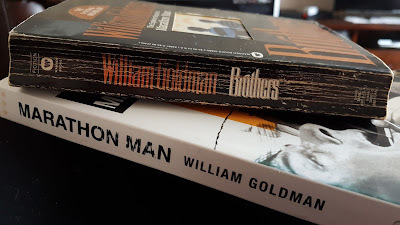 Goldman wrote Marathon Man with such understanding of brotherly love it probably couldn’t be upheld for a second time, and so Brother’s is really Scylla’s story, and that is fine. As a psychological study, Scylla is up there. 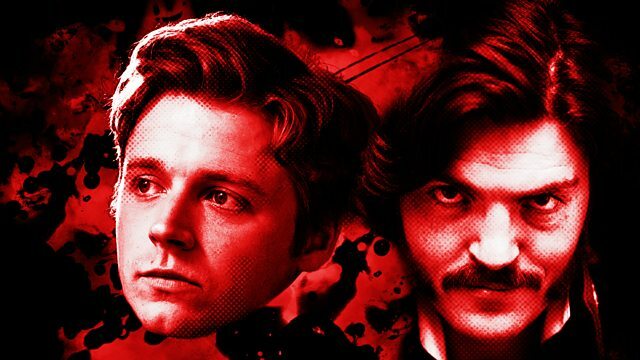 He was an intellectual like his younger brother, but he gave up studying for killing. In his world though, you don’t kill for fun. He is a killer with a conscience, each killing should be done properly…with respect. The first time you meet him you are intrigued. Why did he start working for Division and more importantly why does he stay? It is rather poignant that in Marathon Man he say’s “I want to die with someone who loves me.” Is that why he made such a determined effort to see Babe for one last time? What does this say about the man? Scylla’s dislike of the childish antics of Division resurfaces in this novel. He still hates the cloak and dagger password nonsense, the tests, the games. But his time away has served him well. Again, as in the first book, Goldman manages to keep the light and shade in the novel to keep the reader engaged, Perkins’ note "Go with this cretin. If you think Kilgore is limited, wait until you meet Givens. The calibre of our employees has not been exactly skyrocketing of late” leads the reader to assume that all has not been going well at Division since Scylla left. Throughout the text there are clear markers that Babe still misses Scylla, and Scylla misses Babe. Scylla is warned off trying to find Babe; he's told that the only thing keeping Babe alive is the fact that Scylla is “dead.” As we go through the ups and downs of both brother’s lives, it is only in the final pages of the book that the title takes on a real poignancy, and four short words can become so heart wrenching. As at the time of writing, the plays are still available to listen to on the BBC Radio 4 iplayer. Marathon Man has 14 days left to listen, and Brothers 21 days.